Charlotte Hall Veterans Home has been proudly “Serving Those Who Served” since 1985. The Home is situated on 126 beautiful acres in St. Mary’s County, and offers and a continuum of care from the 168-bed assisted living program to the 286-bed skilled nursing program. Charlotte Hall Veterans Home also offers memory care in secure units. The Home is Medicare/Medicaid certified, and all veterans receive a per diem subsidy from the U.S. Department of Veterans Affairs that reduces their cost of care. The Home is inspected annually, as required by the Office of Health Care Quality, MD Dept. of Health & Mental Hygiene, and by the U.S. Department of Veterans Affairs. Our vision is to continually develop and deliver a safe, dignified and compassionate health care system; and provide a nurturing and engaging home environment for Maryland’s veterans and eligible spouses. Check out our new in-house electronic communication system! Why Select Charlotte Hall Veterans Home? We typically have NO WAITING LIST! However, please call to check availability as our census changes every day. More Affordable - As a benefit of residing in a certified State Veterans Home, veterans who need nursing home or assisted living care are entitled to receive a per diem grant from the US Department of Veterans Affairs towards their cost of care. This benefit is used to lower the veteran’s out of pocket expenses. Needless to say, this enables veterans and their families to save significantly. On-Site Medical Services - Charlotte Hall Veterans Home provides on-site medical services including Physicians, Rehabilitation, Dentistry, Optometry and Podiatry. On-Site Pharmacy - Charlotte Hall Veterans Home provides on-site Pharmacy services including a Pharmacist, which will improve the quality of services, reduce waste, and provide readily available pharmacist support on a daily basis. Quality Care - The Maryland Department of Veterans Affairs works closely with the management contractor’s staff to ensure our veterans receive the best care possible in a clean, caring environment. The staff understands and respects the sacrifices veterans have made and “Serving Those Who Served” is a privilege. Contact us to see why our families would recommend Charlotte Hall Veterans Home! 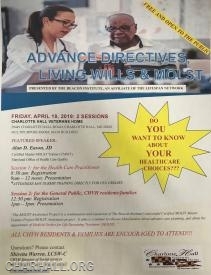 Please join us on April 19, 2019 for Education Sessions on Advance Directive, Living Wills, and MOLST sessions. Please see the attached flyer for more information. Our wish list has been updated. Please feel free to contact us if there are any questions regarding donations for our home. "The nurses and aides that took care of mom went above and beyond to provide a caring and loving environment. My sister and I always remarked of the positive attitudes were were greeted with by all the employees. We are grateful she was able to live her last few years in a less stressful lifestyle." "The nurses were warm, caring, and very much in tune with his needs. My uncle was able to enjoy the end of his life with dignity, pride, and continue his independence in a warm atmosphere." "It is a blessing to know that [my dad] received excellent care and the utmost respect from his extended family at Charlotte Hall." "My parents were moved to the secured unit, which was a very hard adjustment for them. But the staff at Charlotte Hall knew what to do to make them comfortable and feel welcomed." "I want to express our gratitude that [my uncle's] last days were spent at such an extraordinary facility and in the presence of his fellow servicemen and servicewomen." "It would be impossible to acknowledge by name all of the wonderful staff that cared for or simply shared precious moments with our "Poppy" these past 6 years. The family is eternally grateful for the quality care that you gave him and hope these few words convey our deep appreciation and thankfulness for all that you have done." "I have never seen a facility treat their residents/patients with more respect than Charlotte Hall." "It is never an easy situation but the staff at Charlotte Hall gave [my father] all of the loving care that made his final year as joyful as possible. He was treated like the hero that we all knew." "I always felt the staff was interested in making my dad comfortable...they showed compassion, caring and patience with him. provided us with privacy, but were accessible if we needed them." "It was because of each of you that I was able to sleep at night knowing that my father was being cared for and treated with dignity and respect - two things that become precious to all as we age and have to rely on others for our most basic care." "The facility was clean...the staff was happy and helpful, and Dad was in generally good spirits and appeared to be in good shape. Please keep up the good work and thank you for caring for Dad in a respectful and meaningful way." "The fine food and medical care he received were first class and his caretakers were very patient." "We always felt as though your staff looked after Daddy like he was their family member." "We are so glad we decided to choose Charlotte Hall Veterans Home. The Administrative Support is superb. The entire facility is wonderfully maintained and clean. We truly appreciate your compassionate approach in supporting both Dad and us. We cannot say enough good things about the staff members who provided Dad's daily care." "Forever grateful for your kindness in everything."